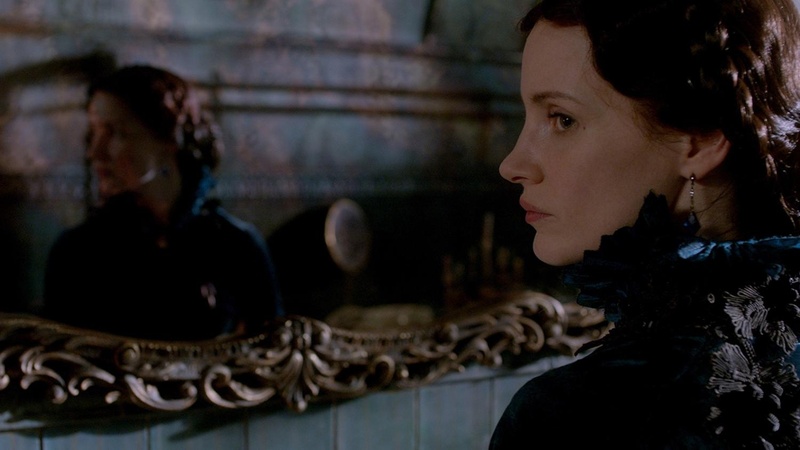 If you’re a fan of horror movies that scare the pants off you, “Crimson Peak” probably isn’t your cup of tea. In the film, as in life, Del Toro isn’t exactly subtle about his novel influences. “The first movie I saw when I was four was ‘Wuthering Heights,’ and then I discovered at the same time ‘Frankenstein’ and ‘Jane Eyre.’ … And I had this immense spiritual love affair with the Brontës and Mary Shelley,” he told website The Mary Sue, instantly winning the hearts of English majors everywhere. This snippet of dialogue isn’t simply a wink to lovers of gothic horror. It’s also a handy bit of foreshadowing in a movie that delights in both reconstructing and deconstructing the conventions of a deliciously dark and stormy genre. As gothic romances are wont to do, “Crimson Peak” centers around a damsel — thanks to a satisfying feminist tweak by Del Toro, she’s more determined than distressed — who falls in love with a man she hardly knows. He sweeps her off to his creepily remote ancestral mansion, where horrible family secrets lurk around every corner and spirits literal and metaphorical prowl the halls. Wasikowska, who radiates strong-willed girlishness, is perfectly cast as Edith, an aspiring author of ghost stories whose first supernatural encounter occurred at age 10, shortly after the death of her mother. Also ideally suited to his role is Tom Hiddleston, smoldering yummily in a top hat and period suit as the enigmatic Thomas Sharpe, a British aristocrat who arrives in New York with a business proposal for Edith’s wealthy father (Jim Beaver). Failing to secure Dad’s approval, he wins the daughter’s heart instead and the newlyweds decamp to England and Allerdale Hall, the cold and gloomy residence of the mostly deceased Sharpe clan. Despite the fact that the walls ooze blood-red clay and there’s a freakin’ hole in the ceiling, through which crisp, autumn leaves artfully flutter, Edith strives to settle into her new home, ever under the sharp, prying gaze of Thomas’ passive-aggressive sister, Lucille (Jessica Chastain, her ginger locks died a morbid jet black). As Thomas’ attentive sibling, Chastain is having way too much fun peeping through keyholes, abruptly materializing in doorways, clutching a jangly set of tempting house keys, and warning Edith not to descend too far into the bowels of the mansion in a rickety elevator that seems to have a mind of its own. Edith has hardly set foot in the place when she begins to make unwitting contact with Allerdale’s other residents, including inky specters who pop up just in time to spoil a nice, hot bath or soothing cup of tea (many of them played in motion capture by Del Toro’s frequent collaborator, Doug Jones). The audience will chuckle at Edith’s stubborn nonchalance, even as the very fabric between earth and hell seems to be unraveling along with her health. But this, my friends, is model behavior for a classic gothic heroine and is as fun to watch as it is maddening, along with all the other trappings of the genre. There’s no lack of entertainment, though, in watching this very game cast play out their grisly roles with twisted passion. And it helps that “Crimson Peak” is ravishing to look at, thanks to the director’s signature attention to detail and opulently gory production design. From the exquisite puff-sleeved Victorian ball gowns, to the dapper top hats, to the bleeding wood-and-melted-wax skeleton that is Allerdale Hall, the film is aflame with glorious costume-drama bedazzlement. It won’t keep you up at night, but it’s a juicy bedtime story anyway. This entry was posted in Uncategorized and tagged Crimson Peak, Doug Jones, Guillermo del Toro, Jane Eyre, Jessica Chastain, Mary Shelley, Mia Wasikowska, Pan's Labyrinth, Tom Hiddleston, Wuthering Heights on October 19, 2015 by Lavender Vroman.